Four years ago, I wrote an article on how to persist GTM’s dataLayer from page to page. Unfortunately, the solution was a bit clumsy, requiring you to give specific commands for the interactions, which made it really unwieldy in the long run. Google Tag Manager still doesn’t offer us a native way to persist the dataLayer array or its internal data model from one page to the other, so I thought it was about time I revisit this idea. One of the difficulties of working with Google Tag Manager and the dataLayer structure is that GTM doesn’t preserve history of the items collected into its data model. Or, at least, it doesn’t preserve it in a manner that would let us access it. This is typically a very niche problem, but it does surface every now and then. 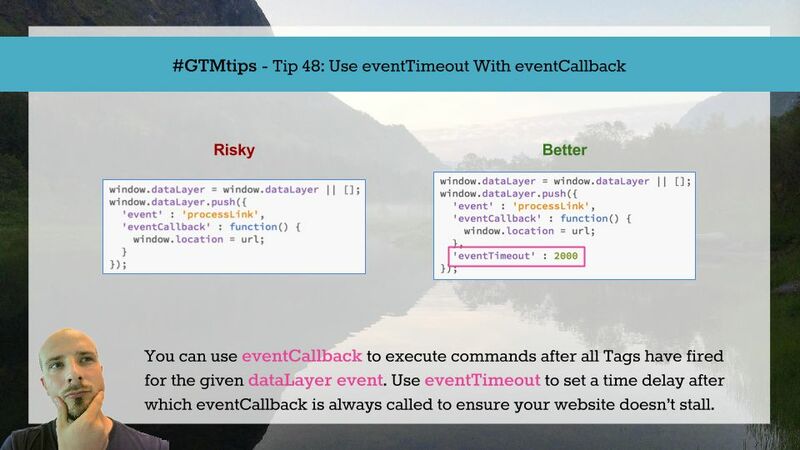 For example, say you wanted to query whether an event with some specific value has already been pushed into dataLayer. 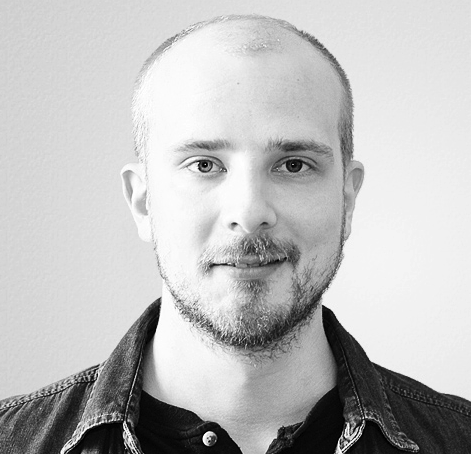 Google Tag Manager should be relatively easy to implement. Just paste the container snippet to the <head> of the page and you’re good to go! 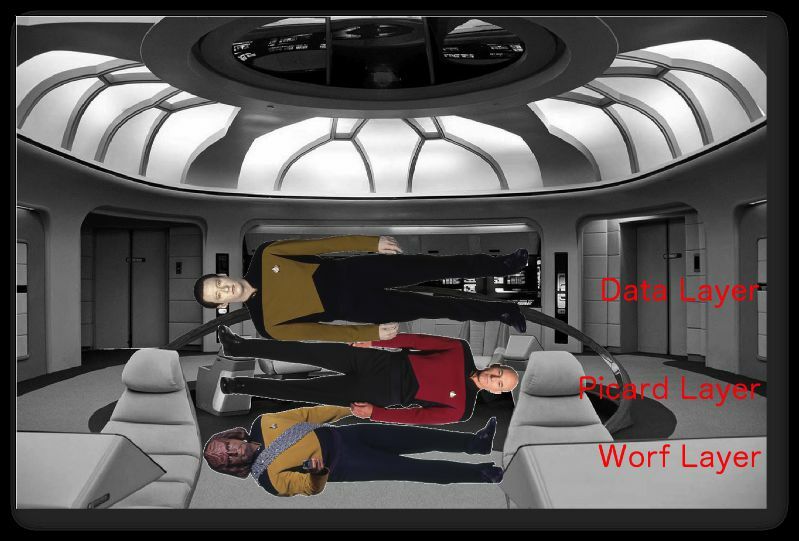 However, at some point you’ll want to configure the dataLayer structure, too (read more about dataLayer here). There are two ways to do it: the right way and the wrong way. In this article, we’ll see what happens if you do it the wrong way, how to identify the issue, and how to fix it. There are times when I’m disappointed with Google’s developer documentation, especially for Google Tag Manager. Most of the time they get it right, and I’d say around 80% of questions being thrown around the forums can be answered just by reading through the documentation. But there are some cases where the documentation is misleading or even downright dangerous. One of these cases is Enhanced Ecommerce. This isn’t going to be a thorough critique of said documentation, but the tip in this post has to do with one of the examples that the documentation gives for measuring Product Clicks. Google Tag Manager is a great tool. Yeah, you came all the way to this article to read that truism. It also performs really well, loading at a sweet, swift pace even on a slow connection, thanks to pretty decent response times from Google servers. On top of that, the library itself loads asynchronously, meaning the container download doesn’t interrupt the browser as it tries to make sense of your messy HTML. 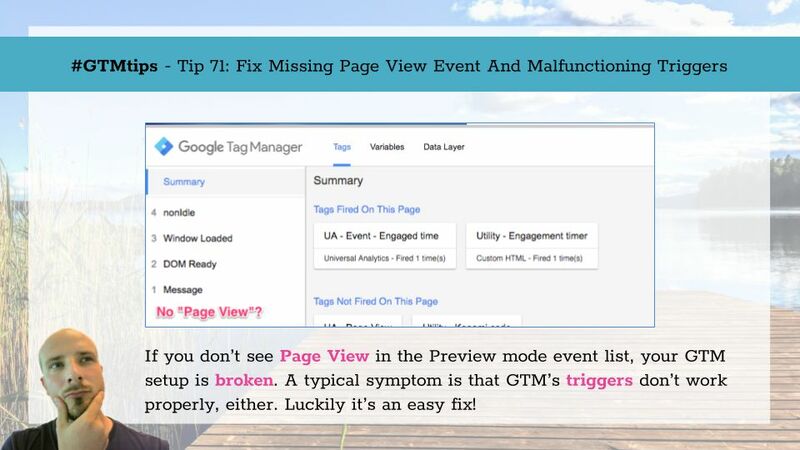 Here’s a tip on how to avoid a horrible, horrible mistake with Google Tag Manager. 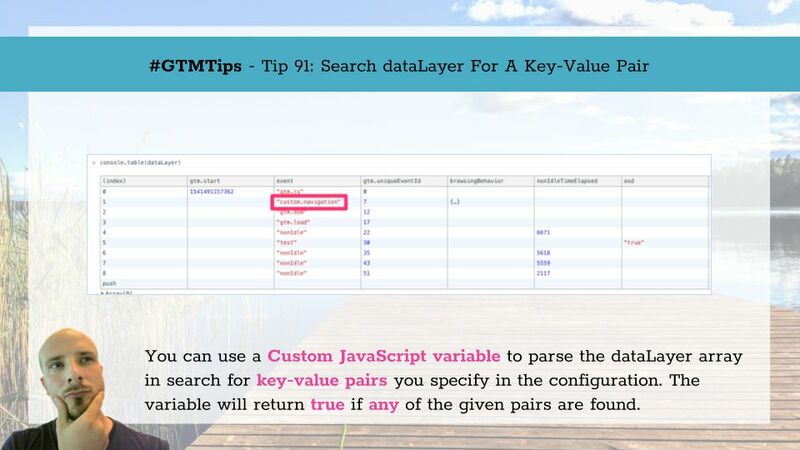 Tip 7: Always use .push() with dataLayer When you assign a value to a variable using the equals ( = ) sign, you are actually reallocating the variable to a new value, and the garbage collection system of the runtime environment sweeps the previous value to bit heaven. 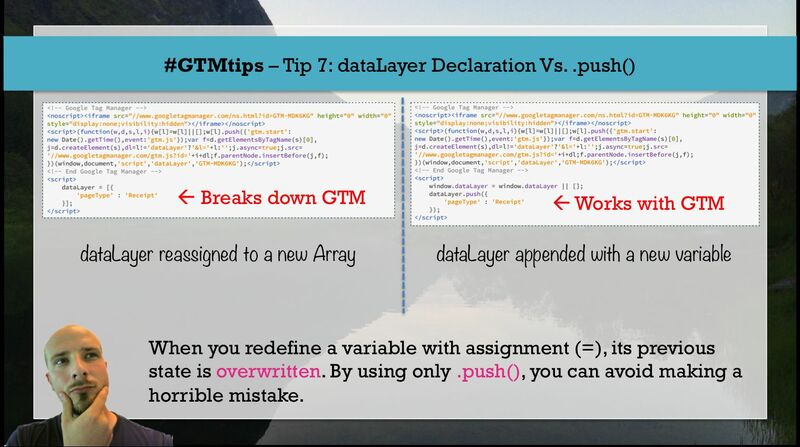 Let’s put it simply: if you redefine dataLayer after the GTM container snippet, you will break GTM’s proprietary functions.